The AMR Industry Alliance ensures that signatories from biotech, diagnostics, generics and research-based pharmaceutical companies collectively deliver on the specific commitments made in the Declaration and the Roadmap and will measure progress made in the fight against AMR. The Declaration sets out a common set of principles for global action that focus on reducing the development of AMR, investing in R&D to meet public health needs and improving access to antibiotics, vaccines and diagnostics. The Declaration also aims at encouraging governments to go beyond political statements. The Declaration specifically calls on governments to commit to allocating the funds needed to create a sustainable market for antibacterials while also implementing measures to prevent infection and improve appropriate use. Signatories: Over 100 biotech, diagnostics, generics and research-based pharmaceutical companies and associations have signed the Declaration. The Roadmap was launched by a group of leading companies in order to drive progress on four key commitments as applicable according to their different businesses and capabilities. These are in line with the Declaration, and reflect the companies’ intent to continue to proactively contribute to the global efforts to address AMR. The signatories of the Roadmap are striving to be at the forefront of the fight against AMR and lead by example. Signatories: A sub-set of companies committed to the Industry Declaration: 13 companies of the 100+ Alliance members are committed to the Roadmap. 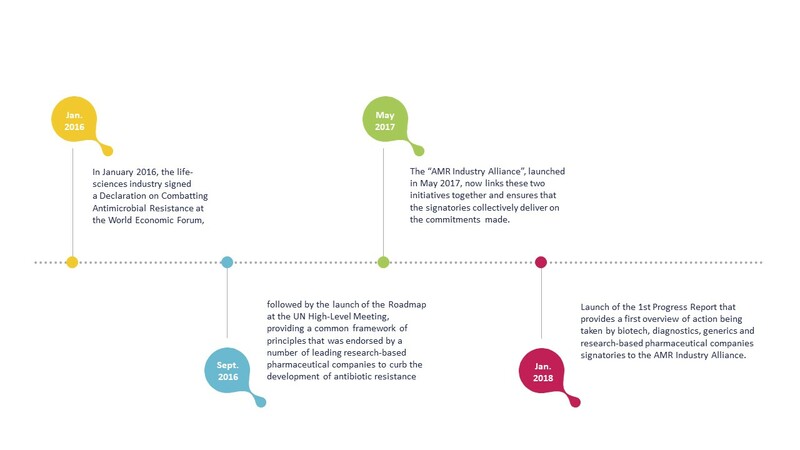 Commitments: The Roadmap lays out four commitments to reduce AMR by 2020: reduce the environmental impact of manufacturing, addressing inappropriate use, improving global access and developing a broad R&D ecosystem.